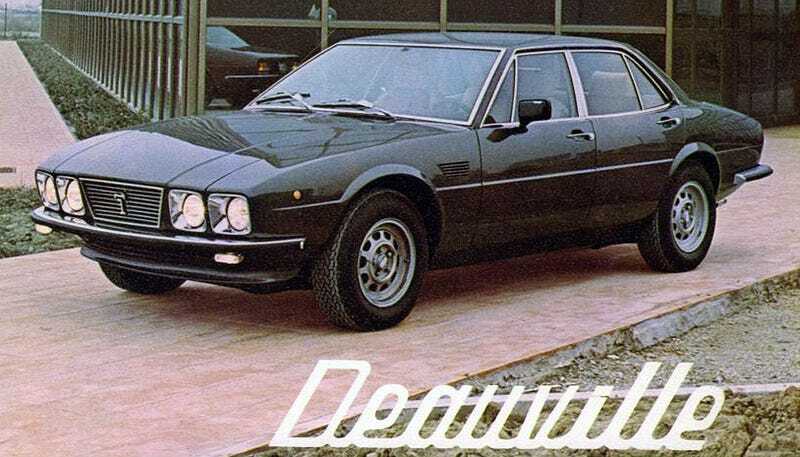 Obviously, one man's "forgotten" is another club's charter, but for most, the De Tomaso Deauville resides just under the radar. That's sad because it's one of the best looking sedans of the 1970s. Jaguar XJ6, eat your heart out. The Deauville looks even better today, after an Italian businessman announced his plans to revive the De Tomaso badge with a flourish, unveiling chunky sedan that looks less like a De Tomaso product than a midsized Volvo designed by a focus group of Chinese plastics executives, who happen to be blindfolded. The late Argentine-born Alejandro de Tomaso showed the Deauville at the Turin Motor Show in 1970. Under the gracefully sloping hood was the same Ford Cleveland V8 as the Pantera. All 351 ci and 330 hp's worth. Only 244 were produced between 1970 and 1985, making them rare birds indeed. In 1972 arrived the De Tomaso Longchamp, a two-door luxury coupe with the same V8 and built on the same, but shortened, chassis. All the Longchamp models ever built between 1972 and 1989 totaled to a mere 409. Midway through the 1970s, after De Tomaso took over Maserati from Citroën, the company launched the Kyalami, which was just a Longchamp powered by a 4.2-liter Maserati V8. That car was discontinued in 1983, to be replaced by the Maserati Biturbo. Among the somber men in white mustaches who judge such vehicles, however, the Deauville remains the most sought after, as much for its styling as for its rarity.